It was European coach builders that first applied coatings of animal fats and wax to protect the custom paint on their horse-drawn carriages. This tradition has endured over 100 years and is still a great way to protect the paint on modern-day coaches. Today, the multilayered auto wax finish on your car, from the primer through the top clearcoat, is only .004 to .006 of an inch thick. Regardless of how fine the finish is now, it will deteriorate and dull. Radiant and ultraviolet energy, acid rain, salt, atmospheric pollution, insect fluids and bird droppings wage a constant war on your car's finish. Car waxing provides an easily renewable, transparent barrier between the finish and a hostile environment. Auto wax also makes your car, new or old, look better. Many quality car waxes combine enriching oils that "wet" the surface with protective formulas of Brazilian carnauba or modern polymers for a high-gloss shine. This brings us to the subject of selecting a car wax. Car Waxes can be made from a natural wax, usually Brazilian carnauba, or synthetically made of polymers and acrylic resins. Car waxes and paint sealants make the surface of a car reflect more light. As a result, the car looks vibrant, looks more alive. Carnauba-based car waxes add an element of depth and warmth to a car. Paint sealants (synthetic car wax) create brilliance and sparkle. Made from modern polymers or acrylic resins, synthetic waxes offer excellent durability and ease of application. Quality synthetic waxes have been known to last 6 to 9 months or longer, and typically wipe on and off very easily. Synthetic waxes create a very bright shine and rarely cloud or streak on the paint. On the down side, many enthusiasts feel synthetic waxes lack depth and richness. Black cars can look a little sterile or silvery in the direct sunlight. And, the mirror-like polymers can collect minor swirls and actually highlight paint flaws. 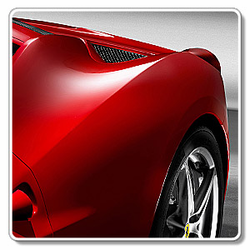 In 2007 a brand new type of automotive surface protection was created by Ultima Finish Care, the clear sealant. Ultima clear sealants are nanotechnology polymer coatings that are highly resistant to detergents, acids and hard minerals, like calcium. Don't let the nanotechnology jargon confuse you. The chemical simply creates a full molecular blanket of protection by using molecules, that are much smaller than water or acid molecules, that bind together to form what looks like a chain link fence of protection. Ultima Finish Care is the first and only company to offer a full range of clear sealant products for complete protection of your automobile. The animation above is how Ultima explains their nanotechnology coating. The most important fact to understand is how the product blocks the harmful elements that cause oxidation and other environmental paint damage. By creating a tough barrier that is many times smaller than water and acid molecules, these harmful elements cannot penetrate the Ultima coating. WHAT DO AUTOMOBILE CLEAR COAT FINISHES REALLY NEED? If the purpose of the clear coat is to add depth and gloss to the final paint finish, wouldn�t it be counterproductive to apply anything that does not buff out to be as clear as the clear coat itself? Carnauba wax in its natural form is not clear. It creates a dull, milky white film on the leaves of the palm tree from which it is harvested. Have you experienced the white stain residue most Carnauba waxes leave in cracks and crevices after waxing? It follows that Carnauba wax will distort the perfectly clear appearance of a new or well-maintained clear coat finish. What the modern clear coat finish requires is proper cleaning and light polishing to remove fine cobweb scratches and swirl marks, and clear, durable protection. Carnauba wax cannot meet this demand. My personal recommendation for all cars with a clear coat finish is Ultima Paint Guard Plus Paint Sealant. Regular auto wax care is necessary for protecting your car's paint from the elements. In addition to sealing and protecting, car waxes and auto sealants also improve the appearance of freshly washed and polished paint. If you use the right products, you can successfully layer waxes and sealants to make your paint look deeper and almost liquid. Polishes & smoothes away swirl marks. Increases paint gloss & slickness. Remove road grime, insect remains, hard water deposits, tar and sap.